The present invention relates to a member with a photocatalyst layer formed on the surface thereof. Formation of the above-described photocatalyst layer on the surface of a member such as glass is frequently carried out by means of vacuum film formation methods including sputtering and vapor deposition, or reduced-pressure film-formation methods. Provision of an undercoat layer between the substrate such as glass and the photocatalyst layer formed on the surface of the substrate has been proposed in Japanese Patent Application Publication No. 9-227167 , Japanese Patent Application Publication No. 10-66878 , Japanese Patent Application Publication No. 2000-312830 , and Japanese Patent Application Publication No. 2001-205094 . Japanese Patent Application Publication No. 9-227167 discloses that a barrier layer is provided between a glass substrate and a photocatalytic composition (medium) which is formed on the surface of the substrate for the purpose of preventing function deterioration of the medium caused by alkali eluted from the glass, and proposes use of zirconium oxide, in particular, amorphous zirconium oxide as the barrier layer. Japanese Patent Application Publication No. 10-66878 discloses that a photocatalyst film is formed on a substrate in a state where an undercoat film is interposed therebetween, and in particular, zirconium oxide is used as the undercoat film and titanium oxide is used as the photocatalyst film. Japanese Patent Application Publication No. 2000-312830 discloses that a layer of a metal oxide such as zirconium oxide is interposed between a substrate (aluminum) and a photocatalyst layer so as to control oxygen diffusion from the photocatalyst layer to the substrate with the aid of the metal oxide layer. Japanese Patent Application Publication No. 2001-205094 discloses zirconium oxide as a photocatalytic material and discloses that a titanium oxide layer is formed on the exterior of the zirconium oxide. PCT International Publication ( WO 02/40417 ) discloses that a high temperature stable type cubic or orthorhombic zirconium oxide layer is formed between a substrate and a titanium oxide layer. US Patent No. 6,027,766 discloses photocatalytically activated self-cleaning articles comprising a self-cleaning coating on top of a sodium ion diffusion barrier layer comprising metal oxides such as zirconium oxide. When a photocatalyst layer is formed according to the above-described methods, there are cases where no photocatalytic function is exerted, or such a function is not exerted unless the thickness of the photocatalyst layer is made thick, which causes the reflectance of the article to become large and interference color to be generated, and thereby the compatibility of the preferable reflectance and color tone with the photocatalytic activity is hardly achieved. Also, there are drawbacks that when a high temperature stable type cubic or orthorhombic zirconium oxide layer needs to be formed, low heat resistance resin and the like cannot be used as a substrate, and photocatalytic members having a large size for use in construction and the like can be hardly obtained because it is technically difficult to heat large size substrates uniformly. In order to solve the above-described problems, researches were made by the present inventors, and it turned out that difference in the degree of crystal growth in a photocatalyst layer causes a state where some of photocatalyst layers (TiO2) exert and others do not exert a photocatalytic function depending on the film configuration and the film-formation conditions even if the photocatalyst layers have the same film thickness. More specifically, a photocatalyst layer (TiO2) in which a columnar particulate structure of polycrystal or single crystal is formed clearly and continuously from the interface of the substrate to the surface of the photocatalyst layer exerts a remarkable photocatalytic effect; however, a photocatalyst layer (TiO2), in which no columnar particulate structure is found in the neighborhood of the interface of the substrate and an amorphous layer (hereinafter referred to as a dead layer) is found instead does not exert any sufficient photocatalytic effect. Accordingly, the present inventors investigated measures for substantially preventing the above-described dead layer from being formed, and discovered that provision of an undercoat layer for promoting crystal growth in the photocatalyst layer can effectively control formation of the dead layer. However, in the case of a configuration in which the above-described dead layer is substantially absent, since a particulate structure is formed from the undercoat layer to the photocatalyst layer, there are cases where chlorine ions and water pass through the voids in the particulate structure (columnar structure) and diffuse from the surface toward the glass substrate. When such diffusing molecules reach the glass substrate, there are cases where anions such as chlorine ions react with alkali ions such as sodium contained in the glass substrate so as to generate salt, which causes film peeling or defects. In order to prevent such phenomena, provision of a peel preventing layer between the undercoat layer and the substrate has been found to be effective. When a photocatalyst layer is formed through the intermediary of an undercoat layer which promotes the crystal growth of the photocatalyst, the generation of the above-described dead layer can be controlled, and when a peel preventing layer is provided between the undercoat layer and the glass substrate, peeling of the film from the glass substrate and the generation of defects can be controlled. In addition, an excellent photocatalytic function can be achieved even if the film formation is conducted at low temperature. Specifically, according to the present invention, there is provided a member having a photocatalytic function comprising: a substrate; an undercoat layer provided on said substrate; and a photocatalyst layer formed on said undercoat layer, wherein said undercoat layer is crystalline, the main component of said undercoat layer is a crystalline zirconium compound which includes monoclinic zirconium oxide crystals and wherein the electron diffraction image obtained by perpendicularly irradiating the cross section of the undercoat layer includes the electron diffraction image from the (111) plane or the (-111) plane of the monoclinic crystal of zirconium oxide, and the interplanar spacing with respect to the (111) orientation plane measured by the electron diffraction image or by a bright-field image of a transmission electron microscope (TEM) is 2.6 to 3.0 Å, and the interplanar spacing with respect to the (-111) orientation plane measured by the same method is 3.0 to 3.5 Å and the main component of said photocatalyst layer is anatase type titanium oxide and a dead layer of from 0 to 20 nm thickness which is observed as a halo pattern in an electron diffraction image is present between said undercoat layer and said photocatalyst layer, wherein at least one of the following features (a) to (c) is further present: (a) said member further comprises a peel preventing layer, whose main component is an oxide, an oxynitride or a nitride of at least one of silicon and tin, provided between said substrate and said undercoat layer and the thickness of said peel preventing layer is from 2 nm to 200 nm, (b) a metal element is doped in said photocatalyst layer and the addition amount of said metal element is in the range from 0.1 to 1.0 mass %, (c) a hydrophilic thin film is formed on the surface of said photocatalyst layer. The thickness of the peel preventing layer is preferably 5 nm to 50 nm. When the thickness of the peel preventing layer is less than 2 nm, the effect of controlling the generation of peeling and defects becomes insufficient. On the other hand, even when the thickness of the peel preventing layer is greater than 200 nm, the effect of controlling the generation of peeling and defects is not largely improved. Therefore, the upper limit of the thickness of the peel preventing layer is preferably 200 nm from the viewpoint of economy. When the thickness of the peel preventing layer is greater than 5 nm, the water blocking effect more preferably is enhanced. In addition, when the thickness exceeds 50 nm, the stress of the amorphous film becomes greater and peeling easily occurs. Therefore, the more preferable upper limit of the thickness of the peel preventing layer is 50 nm. An embodiment of the member having a photocatalytic function according to the present invention has a configuration in which a photocatalyst layer is formed on the surface of a substrate through the intermediary of a crystalline undercoat layer, the substrate is a glass substrate manufactured by a float glass method, the undercoat layer is positioned on the tin-containing surface (namely, the tin modification layer or the amorphous tin oxide layer) of the glass substrate, and no dead layer is substantially present between the undercoat layer and the photocatalyst layer. Provision of the crystalline undercoat layer can improve the crystallinity of the photocatalyst layer, and the surface of the photocatalyst layer can be rapidly made superhydrophilic. Also, provision of the peel preventing layer between the substrate and the crystalline undercoat layer can control peeling of the undercoat layer from the substrate, or defects. The peel preventing layer whose main component is an oxide, an oxynitride and a nitride containing at least one of silicon and tin has a capability of blocking a variety of ions and molecules such as a chlorine ion and water which penetrate from the outside. Also, when a glass plate manufactured by a float process (for example, a method for manufacturing a glass plate by floating molten glass on molten tin) is used as the substrate, a tin oxide containing layer (tin modification layer) is located on the bottom face (which refers to the face in contact with tin; the top face refers to the face not in contact with tin), and this layer functions as the peel preventing layer. The peel preventing layer blocks chlorine ions and water which penetrate from the surface, prevents these ions and molecules from reaching the glass substrate, and thereby, it is possible to control peeling of the undercoat layer from the substrate. It is also possible to control discoloration or defects caused by reaction of carbonic acid gas and water from the atmosphere with alkali components in the glass. The dead layer is a layer in which amorphous (noncrystalline) characteristics are predominant, and the electron diffraction image is observed as a halo pattern as shown in Figure 1(a). On the other hand, in a case where a layer is different from a dead layer, diffraction spots are observed as shown in Figure 1(b). The thickness of the dead layer is 20 nm or less, or more preferably 10 nm or less, as well as a case where no dead layer is present. The dead layer having such a thickness does not cause so much deterioration of the photocatalytic activity which is caused by deterioration of the crystallinity of the photocatalyst layer. The thickness of the photocatalyst layer is preferably 1 nm to 1,000 nm. When the thickness is less than 1 nm, the continuity of the film becomes poor and photocatalytic activity becomes insufficient. In contrast, when the thickness is greater than 1,000 nm, since exciting light (ultraviolet light) does not reach the deep interior of the photocatalyst layer, such an increase of the film thickness does not lead to any further improvement of the photocatalytic activity. In particular, the effect of the undercoat layer is found to be remarkable in a case where the thickness is in the range from 1 nm to 500 nm. A comparison made with respect to the same thickness showed that the case where the undercoat layer is provided presents a larger photocatalytic activity than the case where no undercoat layer is provided. Therefore, it can be said that the thickness range from 1 nm to 500 nm is more preferable. Even when the thickness of the photocatalyst layer is made as thin as 1 nm to 100 nm, if the particulates constituting the photocatalyst layer are formed continuously from the interface of the undercoat layer to the surface of the photocatalyst layer, crystal growth is developed, and thereby the photocatalytic activity can be exerted sufficiently. The width of the particulates constituting the photocatalyst layer along the direction parallel to the substrate is preferably 5 nm or more. This is because if particulate width is less than 5 nm, the crystallinity is low and the photocatalytic activity becomes insufficient. Also, in the present invention, it is preferable that the undercoat layer and the photocatalyst layer are made of a crystalline metal oxide or a crystalline metal oxynitride, and at least one of the distances between oxygen atoms in the crystals which constitute the undercoat layer is approximate to one of the distances between oxygen atoms in the crystals which constitute the photocatalyst layer. When the photocatalyst layer is formed on the undercoat layer, a combination of the undercoat layer and the photocatalyst layer which satisfies the above-described condition allows the photocatalyst layer to grow easily and quickly as a crystalline one with the aid of the oxygen atoms as the common portions. Figure 2(a) shows the atomic arrangement in the (111) orientation plane in the monoclinic zirconium oxide, and Figure 2(b) shows the atomic arrangement in the (101) orientation plane in the tetragonal (anatase type) titanium oxide. With respect to the distances between oxygen atoms, the monoclinic zirconium oxide and the tetragonal (anatase type) titanium oxide are similar to each other (in the range of from 90 to 110%). Accordingly, if the monoclinic crystalline zirconium compound is used as the undercoat layer, the crystalline film of the tetragonal titanium oxide can be formed on the undercoat layer easily. As for the undercoat layer, zirconium oxide to which a small amount of nitrogen is added, zirconium oxynitride, and zirconium oxide to which niobium (Nb) of 0.1 to 10 atomic % is added are preferably used as well as the above-described monoclinic zirconium oxide. When a target to which niobium is added is used for sputtering, generation of arcing can be prevented, and undesirable power control and deterioration of the film formation rate can be prevented. As for the photocatalyst layer, the above-described tetragonal titanium oxide is preferably used. In particular, anatase type titanium oxide is preferably used because the photocatalytic activity thereof is high. In addition to anatase type titanium oxide, rutile type titanium oxide, a composite oxide of titanium and tin, a mixed oxide of titanium and tin, titanium oxide to which a small amount of nitrogen is added, and titanium oxynitride are preferably used. The thickness of the undercoat layer is preferably 1 nm or more and 500 nm or less. The thickness of less than 1 nm is not preferable because the undercoat layer of such a thickness is not continuous and island-like, and thereby the durability is decreased. On the other hand, even when the thickness is greater than 500 nm, the effect of the thickness on the photocatalyst layer becomes substantially the same, and increasing the thickness is economically useless. The more preferable thickness of the undercoat layer is 2 to 50 nm. When the thickness is less than 2 nm, the crystallinity of the undercoat layer becomes low, and hence the effect of promoting the crystal growth of the photocatalyst layer becomes small. When the thickness is greater than 50 nm, the variation of the optical properties (color tone, reflectance) due to the thickness variation becomes large. As for the monoclinic zirconium oxide which is preferable for the undercoat layer, the electron diffraction image obtained by perpendicularly irradiating the cross section of the layer of the monoclinic zirconium oxide includes the electron diffraction image from the (111) plane or the (-111) plane, and the interplanar spacing with respect to the (111) orientation plane measured by the above-described electron diffraction image or by a bright-field image of a transmission electron microscope (TEM) is 2.6 to 3.0 Å, and the interplanar spacing with respect to the (-111) orientation plane measured by the same method is 3.0 to 3.5 Å. As for the anatase type titanium oxide which is preferable for the photocatalyst layer, the electron diffraction image obtained by perpendicularly irradiating the cross section of the layer of the anatase type titanium oxide includes the electron diffraction pattern from the (101) plane, and the interplanar spacing with respect to the (101) orientation plane measured by the above-described electron diffraction image or by a bright-field image of a transmission electron microscope (TEM) is 3.3 to 3.7 Å. In a case where the interplanar spacing of titanium oxide is not in the above-described spacing range, the titanium oxide suffers from deformation in the crystals. Consequently, the film stress becomes great, and peeling easily occurs. Also, since the oxygen positions in the crystal planes are displaced due to the deformation, the consistency of the oxide such as zirconium oxide or the like constituting the undercoat layer with the oxygen positions becomes low, and thereby no desirable crystal growth of the titanium oxide is observed. The methods for forming the undercoat layer and the photocatalyst layer may be any of a liquid phase method (a sol-gel method, a liquid phase precipitation method, a spray method and a pyrosol method), a vapor phase method (a sputtering method, a vacuum deposition method and a CVD method) and the like, and these methods have the effect of improving the crystallinity of the photocatalyst layer with the aid of the undercoat layer. However, a vapor phase method such as a sputtering method, a deposition method and the like is more suitable because it is serves to grow crystals, and thereby it shows particularly significant effect in the present invention. Additionally, doping of metals in the photocatalyst layer can promote carrier generation and accordingly enhance the photocatalytic effect. Examples of the doped metals include Sn, Zn, Mo and Fe, which are suitably high in the effect of improving the photocatalytic activity. With respect to Sn, Zn and Mo, the addition amount is preferably 0.1 mass % or more and 1 mass % or less, more preferably 0.2 mass % or more and 0.5 mass % or less. With respect to Fe, the content thereof in the photocatalyst layer is made to be 0.001 mass % to 1.0 mass %. These limitations are based on the fact that the effect becomes too small in a case where the addition amount is too small, while too great an amount causes disorder in the crystal structure of the photocatalyst and generation of a recombination center, and thereby the photocatalytic activity is deteriorated. Titanium tin composite oxide or titanium tin mixed oxide is used for the photocatalyst layer. By using titanium oxide containing tin, it is possible to improve the maintenance of the hydrophilicity without deteriorating the photocatalytic activity of titanium oxide (TiO2). In a case of forming a film by a sputtering method, the effect of tin contained in the target improves the film formation rate. The content of tin in the photocatalyst layer is 3 atomic % or more and 50 atomic % or less based on the ratio of the number of tin atoms with respect to the total number of titanium atoms and tin atoms. When the content of tin is less than 3 atomic %, the effect of the addition of tin is unpreferably small. On the other hand, when the content of tin is greater than 50 atomic %, the photocatalytic activity is unpreferably deteriorated. By forming a hydrophilic thin film on the surface of the photocatalyst layer, it is possible to increase the hydrophilic effect. The hydrophilic thin film is preferably made of at lease one oxide selected from the group consisting of silicon oxide, zirconium oxide, germanium oxide and aluminum oxide. Among these oxides, silicon oxide is preferable from the viewpoint of the hydrophilicity improvement effect and durability. It is preferable that the hydrophilic thin film is porous. When the hydrophilic thin film is porous, it is possible to enhance the water holding effect and the maintenance performance of the hydrophilicity. Also, the active species such as active oxygen generated in the surface of the photocatalyst layer by irradiation of ultraviolet light can reach the surface of an article, so that the photocatalytic activity of the photocatalyst layer is not so significantly damaged. As the method for forming a porous hydrophilic thin film, a liquid phase method (a sol-gel method, a liquid phase precipitation method, and a spray method) and a vapor phase method (a sputtering method, a vacuum deposition method and a CVD method) are used. If the generally known sol-gel method is employed, a porous thin film can be manufactured easily; however, when organic polymer and higher alcohol are added into the raw material solution of the sol gel method, a porous thin film can be manufactured more easily. As for the vapor phase method such as a sputtering method, by adjusting the film formation conditions so as to increase the dangling bonds in the oxide, for example, by increasing the gas pressure and reducing the oxygen amount in the gas at the time of sputtering, it becomes possible to manufacture a porous thin film. The thickness of the hydrophilic thin film is preferably 1 nm or more and 30 nm or less. If the thickness is smaller than 1 nm, the hydrophilicity is insufficient, while if the thickness is greater than 30 nm, the photocatalytic activity of the photocatalyst layer is damaged. The more preferable range of the thickness is 1 nm or more and 20 nm or less. In this range, the maintenance performance of the hydrophilicity is high when it is not irradiated with light. The method of manufacturing the photocatalytic member according to the present invention comprises the steps of a method for manufacturing a photocatalytic member comprising the steps of: forming a peel preventing layer whose main component is an oxide, an oxynitride or a nitride containing at least one of silicon and tin on the surface of a substrate; forming a monoclinic zirconium oxide layer by a sputtering method at a low temperature of 150°C or below on said peel preventing layer; and forming a photocatalyst layer comprising a crystalline phase on said monoclinic zirconium oxide layer, wherein the electron diffraction image obtained by perpendicularly irradiating the cross section of the monoclinic zirconium oxide layer includes the electron diffraction image from the (111) plane or the (-111) plane of the monoclinic crystal of zirconium oxide, and the interplanar spacing with respect to the (111) orientation plane measured by the electron diffraction image or by a bright-field image of a transmission electron microscope (TEM) is 2.6 to 3.0 Å, and the interplanar spacing with respect to the (-111) orientation plane measured by the same method is 3.0 to 3.5 Å and the main component of said photocatalyst layer is an anatase type titanium oxide, wherein at least one of the following features (a) to (c) is further present: (a) the thickness of said peel preventing layer is from 2 nm to 200 nm, (b) a metal element is doped in said photocatalyst layer and the addition amount of said metal element is in the range from 0.1 to 1.0 mass %, (c) a hydrophilic thin film is formed on the surface of said photocatalyst layer. As described above, according to the present invention, a photocatalyst layer having high photocatalytic activity can be formed, without heating or at temperature of 150°C or below, on a substrate or a thin film having low heat resistance, and thereby it becomes possible to combine a photocatalyst layer with a component having low heat resistance. Also, the present invention can be applied to film formation on a large size substrate such as glass in which uniform heating and control of cracks which may occur at the time of heating and cooling are difficult. Examples of the above-described substrate having low heat resistance include a resin substrate or a film made of acrylic resin, polyethylene terephthalate resin, polyurethane resin, polyimide resin and the like. Figure 1(a) is a transmission electron microscope (TEM) observation picture showing the electron diffraction pattern in a case where a dead layer is present; and Figure 1(b) is a TEM picture showing the electron diffraction pattern in a case where no dead layer is present. Figure 2(a) is a diagram illustrating the atomic arrangement in the (111) plane of monoclinic zirconium oxide, and Figure 2(b) is a diagram illustrating the atomic arrangement in the (101) plane of anatase type titanium oxide. Figure 3 is a schematic cross-sectional view illustrating a member having a photocatalytic function according to the present invention. Figures 4(a) to (d) are scanning electron microscope (SEM) observation pictures for Examples 1 and 2 and Comparative Examples 1 and 2, respectively. Figure 5 is a graph showing the results of X-ray diffraction measurements in Example 1 and Comparative Examples 1 and 2 which shows the relationship between the undercoat layer and the crystallinity of TiO2 in the photocatalyst layer. Figure 6 is a schematic cross-sectional view illustrating another embodiment of a member having a photocatalytic function according to the present invention. Figure 7 shows optical microscope pictures of the surfaces of Example 18 and Comparative Example 16 after a salt spray test which show the effect of the peel preventing layer. Figure 8 is a high resolution TEM picture which shows the cross section of the ZrO2 layer and the TiO2 layer in Example 18. Figure 9 is a high resolution TEM picture which shows the cross section of the ZrO2 layer and the TiO2 layer in Example 17. Figure 10 is an X-ray diffraction profile of the sample in Example 17. A detailed description will be made below on embodiments of the present invention referring to the accompanying drawings. Figure 3 is a schematic cross-sectional view illustrating a member having a photocatalytic function according to the present invention. In this typical example, a layer of crystalline ZrO2 is formed as an undercoat layer in a thickness of 56 nm on the surface of a glass plate as a substrate, a layer of crystalline TiO2 in which metal is doped is formed as a photocatalyst layer in a thickness of 140 nm on the ZrO2 layer, and a porous SiO2 layer is formed in a thickness of 5 nm on the TiO2 layer so as to enhance the hydrophilicity. The above-described ZrO2 layer, TiO2 layer and SiO2 layer are formed by a sputtering method. Metal such as tin (Sn), zinc (Zn), molybdenum (Mo) or iron (Fe) is doped at the time of forming the TiO2 layer. 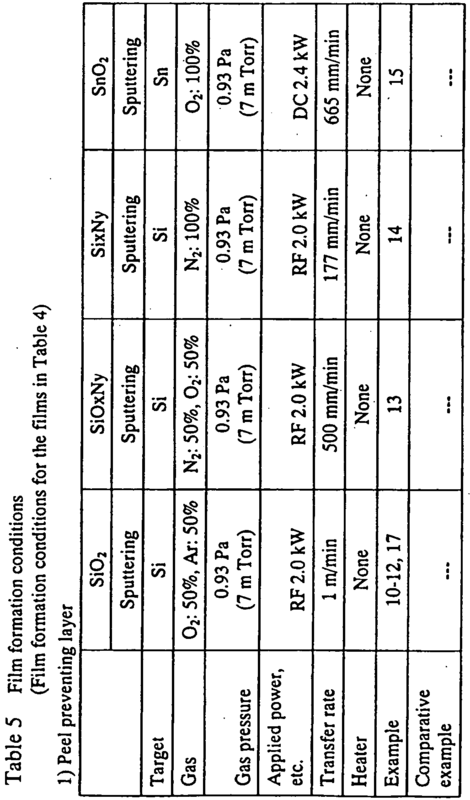 Table 1 shows the film configuration, the methods for forming the peel preventing layer, the undercoat layer, the photocatalyst layer and the hydrophilic thin layer, the presence of a dead layer, and the evaluation of the contact angle in Examples 1 to 9. 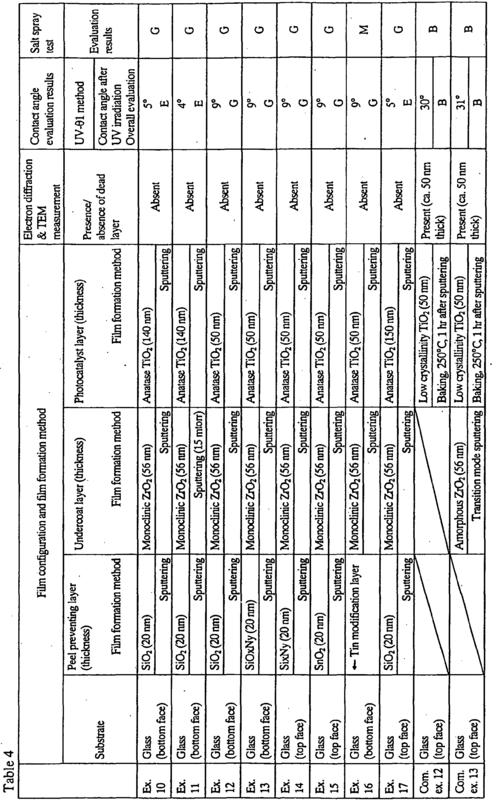 Table 2 shows the film configuration, the methods for forming the peel preventing layer, the undercoat layer, the photocatalyst layer and the hydrophilic thin layer, the presence of a dead layer, and the evaluation of the contact angle in Comparative Examples 1 to 11. Table 3 shows the film formation conditions for each film in Table 1 and Table 2 (i.e., the peel preventing layer, the undercoat layer, the photocatalyst layer and the hydrophilic film). The number of the film formation pass was appropriately adjusted so as to achieve a predetermined thickness. In the hydrophilicity evaluation, UV-θ1 method and UV-θ3 method were adopted in a case where a hydrophilic thin film was not coated, and while UV-θ2 method was adopted in a case where a hydrophilic thin film was coated. UV-θ1 method is a method in which irradiation with ultraviolet black light having an intensity of 1 mW/cm2 is conducted for 15 minutes, and the contact angle with respect to pure water is measured immediately after completion of the irradiation. UV-θ3 method is a method in which the period of time for the ultraviolet light irradiation in UV-θ1 method is changed to 60 minutes. When the contact angle with respect to pure water is small, which means that the hydrophilicity is high, it can be said that the photocatalytic activity is high, and also the antifouling property is high. The overall evaluation was conducted based on the following reference. UV-θ2 method was basically applied to a case where a hydrophilic thin film was coated onto the surface of a photocatalyst layer. In such a case where a hydrophilic thin film is coated, the initial contact angle is small, and thereby a comparison of the contact angles before ultraviolet light irradiation and after ultraviolet light irradiation is difficult. Therefore, liquid of 5 ml which constituted of hexane, 2-propanol and propionic acid at a ratio of 6:1:3 was applied onto the surface, and the contact angle change caused by ultraviolet light irradiation (1 mW/cm2, 15 minutes) was measured. The contact angle immediately after completion of the ultraviolet light irradiation can be considered an index of the photocatalytic activity and the antifouling property. Also, the contact angle was measured after storage in the dark for 2 weeks subsequent to completion of the ultraviolet light irradiation, and the results ware used as an index of the maintenance performance of the hydrophilicity based on the following reference. Figures 4(a) to (d) are scanning electron microscope (SEM) observation pictures for Examples 1 and 2 and Comparative Examples 1 and 2, respectively. As shown in Figures 4(a) and (b), a columnar particulate photocatalyst layer (TiO2) is formed on the undercoat layer (crystalline ZrO2) in Examples 1 and 2. On the other hand, as shown in Figure 4(c), in Comparative Example 1, although a columnar particulate photocatalyst layer (TiO2) is formed, the thickness thereof is small, and a dead layer is formed around the interface between the amorphous undercoat layer (Si3N4) and the photocatalyst layer (TiO2). Also, as shown in Figure 4(d), in Comparative Example 2 where no undercoat layer is provided, titanium oxide (TiO2) in the photocatalyst layer does not grow into large particles, which suggests that the crystallinity is low. Figure 5 is a graph showing the results of thin film X-ray diffraction measurements for Example 1 and Comparative Examples 1 and 2. From the results, it was confirmed that TiO2 of Example 1 where the undercoat layer was constituted of crystalline ZrO2 showed a diffraction peak which was ascribable to anatase (101), and the crystallinity of the TiO2 was high. 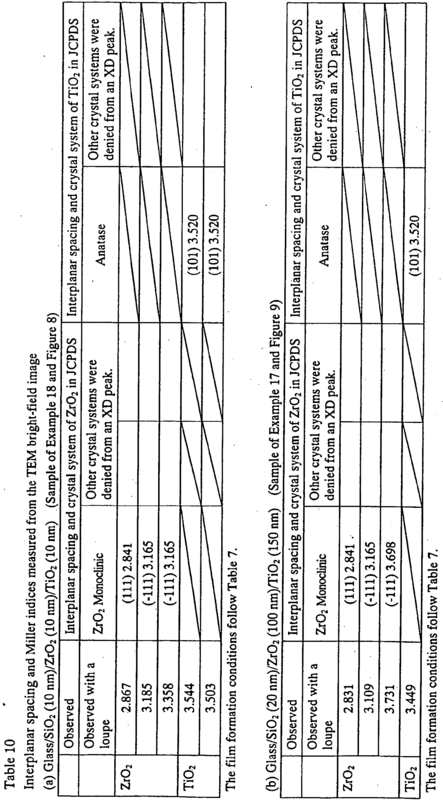 On the other hand, TiO2 of Comparative Example 1 where the undercoat layer was constituted of amorphous Si3N4 showed a crystal peak of rutile (110) to some extent, but did not show a crystal peak of anatase (101), and in Comparative Example 2 where no undercoat layer was provided, neither a crystal peak of anatase (101) nor a crystal peak of rutile (110) was observed. With this, it was confirmed that the crystallinity of the TiO2 in Comparative Examples was low. The TiO2 of Comparative Examples had low crystallinity or no crystallinity by the X-ray analysis, but it was confirmed that microcrystals of anatase or rutile were present on a dead layer which was observed as a halo pattern according to an electron diffraction. Such TiO2 will be hereinafter referred to as low crystalline TiO2. As can be seen from the above-described experimental results, the presence of the dead layer prevents the particulate crystal structure of the photocatalyst layer from growing, which causes low photocatalytic activity. Specifically, it can be seen that the absence of the dead layer verifies the growth of the particulate crystal structure of the photocatalyst layer (TiO2) which is necessary for exerting high photocatalytic activity. In order to prevent the dead layer from being generated, it is necessary that at least a crystalline undercoat layer is present under the photocatalyst layer, and it can be said that formation of an anatase type TiO2 layer on a monoclinic ZrO2 undercoat layer is most suitable for enhancing the crystallinity of TiO2. In Comparative Examples 3 and 4, a TiO2 layer was formed on an amorphous ZrO2 undercoat layer. In Comparative Example 3, the amorphous ZrO2 layer was obtained by conducting film formation by transition mode sputtering. In Comparative Example 4, the amorphous ZrO2 layer was obtained by employing an ion assisted deposition method so as to eject oxygen ions into a film and thereby disorder the structure of the film. The TiO2 layer formed on such an amorphous ZrO2 undercoat layer has low crystallinity, and a thick dead layer was formed in this instance, which is different from Examples where the TiO2 layer was formed on the monoclinic ZrO2 undercoat layer. Consequently, it is not the material of the undercoat layer but the crystallinity of the undercoat layer that affects the crystallinity of the TiO2 layer. Now, a brief description will be made below on the transition mode sputtering method which was employed for film formation of the zirconium oxide film in Comparative Example 3 and Comparative Example 13. In reactive sputtering from a metal target, when oxidation occurs on the surface of the metal target, the film formation rate comes to be lowered. Accordingly, by sensing the oxidation state of the target through monitoring the emission state of oxygen with a plasma emission monitor, and by performing feedback of the obtained information to the gas flow rate control system, it becomes possible to form an oxide film at a higher film formation rate. This method is referred to as a transition mode sputtering method. Next, a description will be made below on the film formation examples with respect to the peel preventing layer formed between the substrate and the undercoat layer, and on the results of a salt spray test. Table 4 shows the film configuration, the methods of forming the peel preventing layer, the undercoat layer, the photocatalyst layer and the hydrophilic thin layer; the presence of a dead layer, the results of contact angle evaluation, and the results of a salt spray test in Examples 10 to 17 and Comparative Examples 12 and 13. Table 5 shows the film formation conditions for the peel preventing layer, and the film formation conditions for the other films (the undercoat layer and the photocatalyst layer). Sodium chloride (extra pure reagent) was dissolved into ion-exchange water to prepare about 5% saline water. A test sample of 100 x 100 mm was fixed in an apparatus (CASSER-ISO-3, manufactured by Suga Test Instruments Co., Ltd.) so as to incline by 20 ± 5 degrees from the vertical line, and the saline water was sprayed onto the test sample at a rate of 1 to 2 ml/hr. After the continuous spraying for 120 hours, the test sample was taken out and film peeling was observed. G (Good) ... No film peeling and defect can be observed by a visual inspection and with an optical microscope. M (Mean) ... Defects can be partly observed with an optical microscope. B (Bad) ... Film peeling can be observed by a visual inspection or with an optical microscope. According to the test results shown in Table 4, a peel preventing layer (SiO2, SixNy, SnO2, and SiOxNy) was formed on the glass substrate, and no film peeling and no defect was observed by a visual inspection and with an optical microscope in Examples 10 to 15 and 17. In Example 16 where the undercoat layer and the photocatalyst layer were formed directly on the bottom face of a glass substrate manufactured by a float process, since the tin modification layer present on the bottom face blocks various kinds of ions and molecules to some extent, no film peeling was observed by a visual inspection and with an optical microscope, and defects were only partly observed with an optical microscope. In Comparative Examples 12 and 13 where no peel preventing layer was provided, film peeling was observed. Next, a description will be made below on another embodiment of the present invention with reference to Figure 6. A description will be omitted on the same matters as the above-described Examples. Figure 6 is another cross-sectional view of a member having a photocatalytic function according to present invention, which shows a schematic diagram illustrating the relationship between the columnar particulate structure of the film and the crystallites. In this embodiment, a peel preventing layer is formed on the surface of a glass plate as a substrate, a monoclinic ZrO2 layer is formed as an undercoat layer, and a crystalline TiO2 layer is formed as a photocatalyst layer on the monoclinic ZrO2 layer. (Note) The average temperature of the substrate at the time of each film formation was about 60°C (based on thermolabel). Only in Example 26, the average temperature of the substrate at the time of each film formation was about 120°C (based on thermolabel). 1) The abrasion resistance test was conducted by using a Taber testing machine under the conditions that the load was 500 g, the number of rotation was 10, and the speed of rotation was 60 rpm. 2) Ultrasonic cleaning was conducted for 5 minutes in acetone, and thereafter UV ozone cleaning was conducted for 3 minutes. 3) Observation and evaluation of the sample were made by a visual inspection. M (Mean): Abrasive scratches were partly observed. B (Bad): Film peeling partly occurred. 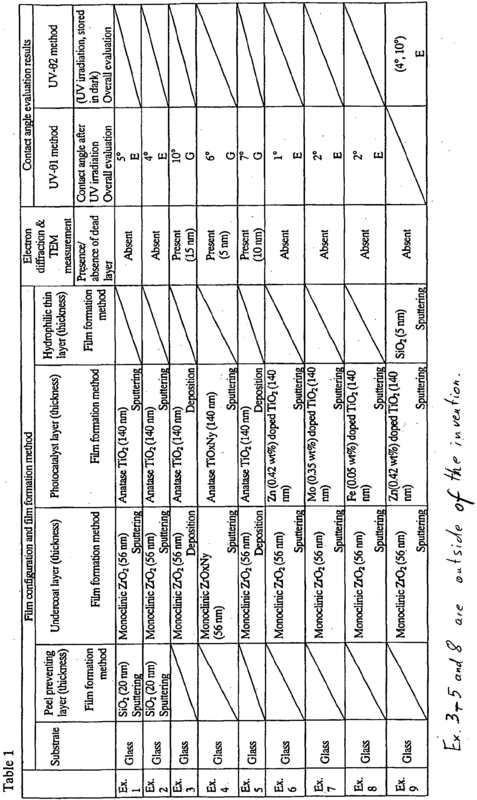 Table 7 shows the film formation conditions for each film (the peel preventing layer, the undercoat layer, and the photocatalyst layer) of Examples 18 to 26 shown in Table 6. Figure 7 also shows the optical microscope pictures of Example 18 (having a peel preventing layer) and Comparative Example 16 (having no peel preventing layer) after a salt spray test. No film peeling was observed in Example 18 having a peel preventing layer, while spot-like film peeling was observed in Comparative Example 16 having no peel preventing layer, which verifies the effect of the peel preventing layer. The applied power and the number of the film formation pass were appropriately adjusted so as to achieve a predetermined thickness. 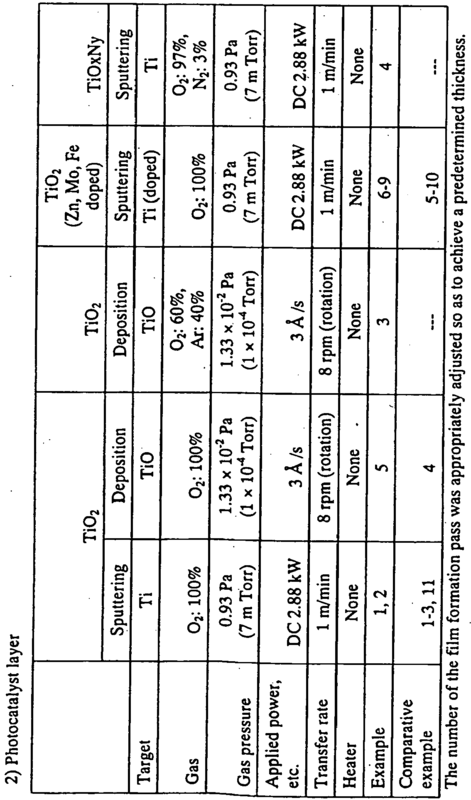 Table 8 shows a comparison of the hydrophilization properties and the film formation rate of the titanium tin oxide layer on the monoclinic ZrO2 undercoat layer in Examples 18 and 27 to 29. 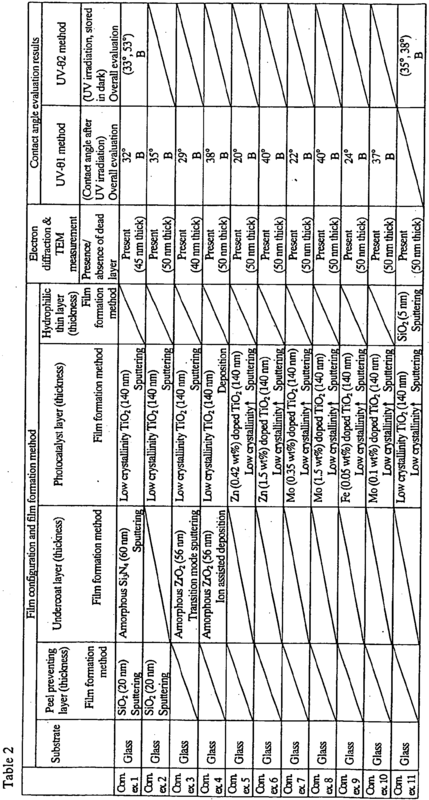 Table 9 shows the film formation conditions for the photocatalyst layer of Examples in Table 8, wherein the film formation conditions for the other layers, i.e., the peel preventing layer and the undercoat layer are the same as those shown in Table 7. It can be seen that the use of titanium oxide to which tin is added improves the hydrophilicity maintenance property in the dark. Also, it can be confirmed that the addition of tin improves the film formation rate in a sputtering method. X-ray diffraction profile measurement shows that these tin doped photocatalyst films are excellent in crystallinity and tend to have rutile crystallinity. Note 1) After measurement was made by UV-θ3 procedure, the sample was stored in the dark for 1 week, and thereafter the contact angle with respect to pure water (while being increased) was measured. The peel layers and undercoat layers were embodied under the same conditions as those shown in Table 7. The applied power and the number of the film formation passes were appropriately adjusted for the purpose of achieving the respective predetermined thicknesses. In order to verify the above-described results, a high resolution TEM picture of Example 18 is shown in Figure 8. Figure 8 shows a structure in which the (-111) plane of ZrO2 (monoclinic) is continuous with the (101) plane of TiO2 (anatase) with an inclination is observed in the TiO2 film which is grown on the ZrO2 film. A high resolution TEM picture of the cross section of the ZrO2 film and the TiO2 film in Example 17 is shown in Figure 9. The ZrO2 film and the TiO2 film in Example 17 has a thickness of 10 times or more compared to each film in Example 18. A lattice pattern is found on the interface with respect to each thin film, and this figure shows that a structure in which the monoclinic ZrO2 (-111) plane is continuous with the anatase type TiO2 (101) plane is observed. This figure also shows that the monoclinic ZrO2 (110) plane is continuous with the anatase type TiO2 (101) plane in some portions. Figure 10 shows an X-ray diffraction profile of Example 17, in which peaks of the anatase type TiO2 and the monoclinic ZrO2 were observed. As described above, when a photocatalyst layer is formed on the surface of a substrate, by providing a crystalline (monoclinic) undercoat layer and forming the photocatalyst layer on the undercoat layer, the photocatalyst crystals are allowed to grow continuously up to the surface of the photocatalyst layer. Also, by providing a peel preventing layer between the substrate and the undercoat layer, peeling and defects can be controlled. As a result, it is possible to obtain a member having high photocatalytic activity and a high antifouling property which can be applied to all the members for use in glass panes for construction, glass plates for displays, glass substrates for DNA analysis, portable information devices, sanitary equipments, medical care equipments, biomedical test chips, materials for hydrogen/oxygen generation devices, and the like. Also, by forming the peel preventing layer whose main component is an oxide, an oxynitride and a nitride containing at least one of silicone and tin on the surface of the substrate, forming the monoclinic zirconium oxide layer at low temperature of 150°C or below, and thereafter forming the photocatalyst layer comprising a crystalline phase, it becomes possible to combine with a material having low heat resistance. In addition, since precise control of the temperature distribution in heating is not required, the present invention can be applied to film formation on a large size plate glass easily. (c) a hydrophilic thin film is formed on the surface of said photocatalyst layer. The member according to claim 1, wherein said substrate is a glass plate manufactured by a float process, and said peel preventing layer is a tin modification layer formed on the bottom face of said glass plate at the time of manufacturing said glass plate. The member according to claim 1 or claim 2, wherein the thickness of said photocatalyst layer is from 1 nm to 1,000 nm. The member according to any one of claims 1 to 3, wherein the thickness of said undercoat layer is from 1 nm to 500 nm. The member according to any one of claims 1 to 4, wherein the particles which constitute said photocatalyst layer are formed continuously from the interface with the undercoat layer to the surface of the photocatalyst layer. The member according to claim 5, wherein the width of said particles along the direction parallel to the substrate is 5 nmor more. The member according to any one of claims 1 to 6, wherein said undercoat layer is comprised of a metal oxide or a metal oxynitride which is crystalline, and at least one of the distances between oxygen atoms in the crystals which constitute the undercoat layer is in the range from 90 to 110% with respect to at least one of the distances between oxygen atoms in the crystals which constitute the photocatalyst layer. The member according to any one of claims 1 to 7, wherein the electron diffraction image obtained by perpendicularly irradiating the cross section of the photocatalyst layer includes the electron diffraction pattern from the (101) plane of the crystal of anatase type titanium oxide, and the interplanar spacing with respect to the (101) orientation plane measured by the electron diffraction image or by a bright-field image of a transmission electron microscope (TEM) is 3.3 to 3.7 Å. The member according to any one of claims 1 to 8, wherein said metal element is at least one of Sn, Zn and Mo. The member according to any one of claims 1 to 9, wherein the addition amount of said metal element is in the range from 0.2 to 0.5 mass %. The member according to any one of claims 1 to 8, wherein said metal element is Fe and the addition amount thereof is in the range from 0.001 to 1.0 mass %. The member according to any one of claims 1 to 11, wherein said hydrophilic thin film comprises at least one oxide selected from silicon oxide, zirconium oxide, germanium oxide and aluminum oxide. The member according to claim 12, wherein said hydrophilic thin film comprises silicon oxide. The member according to any one of claims 1 to 13, wherein said hydrophilic thin film is porous. The member according to any one of claims 1 to 14, wherein the thickness of said hydrophilic thin film is in the range of from 1 to 30 nm. The member according to any one of claims 1 to 15, wherein the thickness of said hydrophilic thin film is in the range of from 1 to 20 nm. The member according to any one of claims 1 to 16, wherein at least said undercoat layer and said photocatalyst layer are formed by a vapor phase method. The member according to claim 17, wherein said vapor phase method is a sputtering method. CH557546A (en) * 1972-10-19 1974-12-31 Balzers Patent Beteilig Ag Of a plurality of simple or laws (lambda) / 4 layers covering existing antireflective. ES2295365T3 (en) 2008-04-16 photoactive coating responds to visible light, coated article and method of manufacture thereof. Inventor name: KIJIMA, YOSHIFUMI, NIPPON SHEET GLASS CO.LTD. Inventor name: MORI, KENJI, NIPPON SHEET GLASS CO.LTD. Inventor name: ANZAKI, TOSHIAKI, NIPPON SHEET GLASS CO.LTD. Owner name: NIPPON SHEET GLASS CO., LTD.